John Marin and Erick Villarruz muse on life’s impermanence in their two-man show, “Dead Leaves and Dirty Grounds,” a capsule of stories in 12 canvases. Marin’s painted faces are arresting in their realism, with eyes that draw one in and a monochromatic visual narrative that makes one linger. Created in the likeness of others but self-portraits to the artist, Marin’s canvases capture his experience and perceptions about the stories of others. As storyteller, he uses single frames to define the utmost beauty of youth (Late Bloomer), portray the cyclic nature of intimacy (The Fire of Prince Vincent), and shape the density of grief (The Crusader). Moving from social realism to the melancholia of personal history, Marin continues to challenge the ideal with interpretations of human vulnerabilities. In his pieces, time flows and ebbs, while we stand on the ever-shifting shore. Eric Villarruz, on the other hand, dives into an ocean of introspection with vivid, phantasmic canvases. 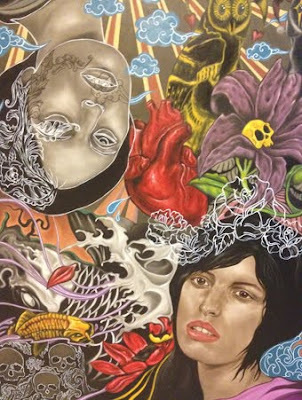 Layering images and styles from hyperrealism to cartoons and graffiti, Villarruz’s subjects are not defined by physical space, but by the reality of psychological and experiential existence. In deconstructing experiences both personal and representational, complex narratives intertwine in his pulsating landscapes, resembling a dense forest or a deep, open wound. In his piece, How is your heart? the artist uses a wealth of symbolism to illustrate the duality of character, emotion, and ultimately, human motive. Transience, to Villarruz, is a stark reminder of our susceptibility to change. The artists are undergraduates at the Technological University of the Philippines and have been painting professionally since 2009. 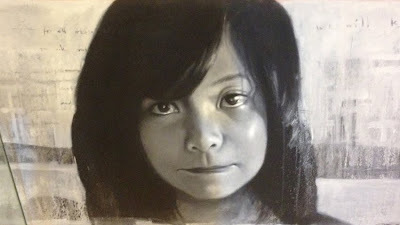 Marin is a 2011 Shell National Art Competition award recipient, while Villarruz received recognition at the 2011 Metrobank Art & Design Excellence Competition. 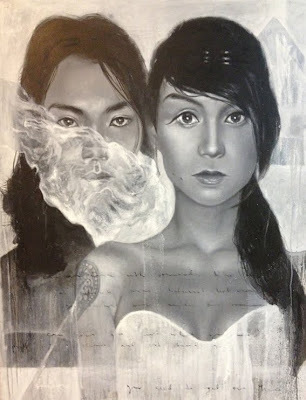 “Dead Leaves and Dirty Grounds” is on exhibit until March 24 at Vinyl on Vinyl at The Collective, 7274 Malugay St Makati.